The International Congress on Planted Forests is an international academic conference that is being organized by the International Union on Forest Research Organizations (IUFRO) with the technical support of the Food and Agriculture Organization of the United nations through its Planted Forests Programme. Three Congresses have been held so far. The 4th ICPF aims to investigate the contribution of planted forests to green development in the context of global changes. The 4th ICPF focussed on an interface between the scientific community, the wider society and government policy initiatives related to planted forests. The 27th session of Asia Pacific Forestry Commission (APFC) meeting was organized by the FAO of the United Nations and hosted by the Forest Department of Sri Lanka during 23-27 October 2017 in Colombo, Sri Lanka. The theme of the APFC “Forestry in a New Landscape” aims to cover a range of related topics including climate finance, forest and landscape restoration, community based forestry and urban forestry. As part of IUFRO All Division 5 Conference with the theme ‘Forest Sector Innovations for a Greener Future’, TEAKNET in association with IUFRO Teakwood Working Party (Div 5.06.02) organized a Partner Event “Teak Resources for a Sustainable Future” on Friday, 16 June 2017 at Port of Singapore, Hotel Pinnacle Harbourfront, Vancouver. Delegates from the Africa, Asia, Europe, Latin America and from other regions attended the Partner Event. The latest issue (No. 26/2) of ITTO’s Tropical Forest Update (TFU) has released. The issue features an interview with Dr Gerhard Dieterle, ITTO’s Executive Director, where he laid out his vision on the potential of tropical forest to address global issues and ITTO’s role in this. An ex-post evaluation has found that an ITTO-supported project in Myanmar helped the conservation of high-quality teak genetic materials but would have benefited from more attention to social and policy aspects. 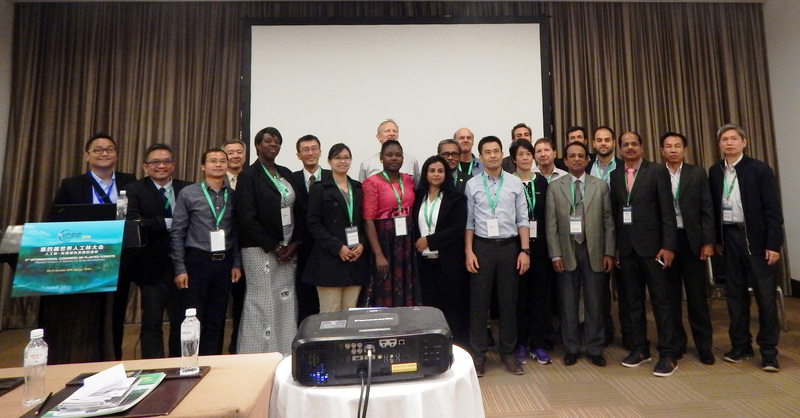 The International Teak Information Network (TEAKNET) in association with Teakwood Working Party of International Union of Forest Research Organizations (IUFRO) Div 5.06.02 and FAO of the United Nations jointly organized a Partner Event, “Global Significance of Teak: Present and Future” on 24th February 2016 during the Asia Pacific Forestry Week, 22-26 February at Clark Freeport Zone, Pampanga, Philippines. The Partner Event was organized under Stream 1: Pathways to Prosperity: Future Trade and Markets of the APFW 2016. TEAKNET also set up an Exhibition booth in the conference venue that attracted large number of participants of Forestry Week. The 3rd World Teak Conference 2015 with the theme “Strengthening Global Teak Resources and Markets for Sustainable Development" was held in Guayaquil, Ecuador during 11-15 May 2015. The Conference was attended by 341 registered participants from 35 countries representing 5 continents, to share knowledge and experience and to exchange ideas on the multiple economic, social and environmental benefits that teak resources can provide. Regional workshop on "Processing and Marketing of Teak Wood Products of Planted Forests", KFRI, Peechi, India, 25- 28 Sept 2007. Teak (Tectona grandis L.f) is being grown in plantations in more than 36 tropical countries across the globe although its natural occurrence is limited to India, Laos Myanmar and Thailand. Of the estimated 187.1 million hectares of global forest plantations in 2000, about 5.7 million hectares (3%) were teak, representing about 75% of the world’s high-quality tropical hardwood plantations, the major producers being India, Indonesia, Myanmar and Thailand. International Conference on "Quality Timber Products of Teak from Sustainable Forest Management", Kerala Forest Research Inst. With the financial support of International Tropical Timber Organization (ITTO), the Kerala Forest Research Institute (KFRI), hosted an International Conference on Quality Timber Products of Teak from Sustainable Forest Management (SFM) in Peechi, Kerala, India, during 2-5 December 2003. The proceedings of the conference present some of the best available scientific information on teak silviculture and utilization and proposing strategies for promoting quality teak products in the global market.